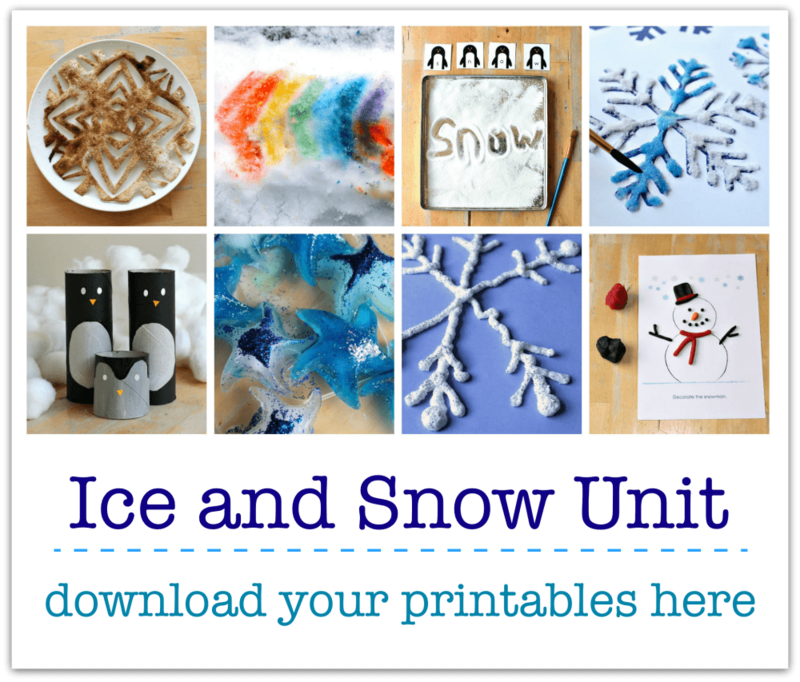 Here’s an great idea for some pretend play with ice – make the South Pole! It’s lots of fun, and an excellent way to enrich learning. Ice is an amazing – free! – sensory material for children to explore. 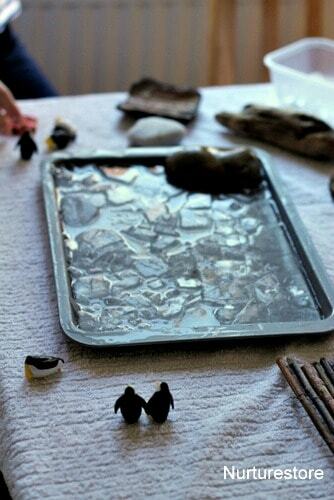 With a few added extras you can set up a miniature South Pole, for lots of pretend play. This little play scene is really easy to set up, but you do need to play ahead just a little as you need to factor in some freezing time. Take a shallow baking tray that will fit inside your freezer, lay it flat on a freezer shelf, pour in some water and leave it for a few hours or overnight until it is solid. Then set up some loose parts as a prompt to try out some pretend play. I like to provide materials for the children to use, but leave it to them to do the actual creating of the small world. :: and some ice gems. With this kind of play it’s all about the imagination, so you don’t need to be totally realistic. 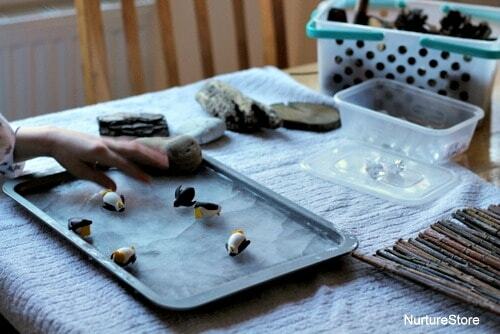 You can offer bits and bobs that you already have and see how the children decide to incorporate them in their play. but soon discovered how slippy the ice was, and how fun it was to let the penguins slide around. 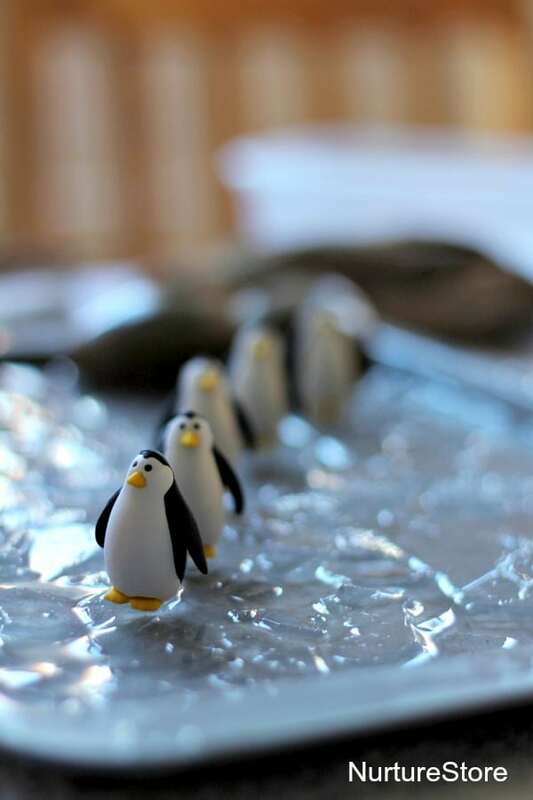 As the ice began to melt a little, she discovered her penguins could whiz around even faster. 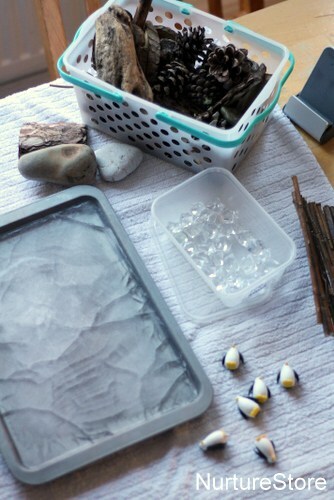 And using a material such as ice brings dramatic changes to the play. 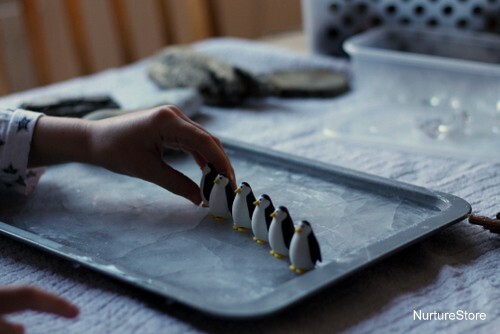 What will the penguins do when the ice breaks up? How will they stay together? Who’s going to look after the babies? Pretend play offers children so much opportunity to play, create and explore with ideas they’ve learnt from elsewhere. Adding in a small world like this, right the way through for children who are six, seven, eight, nine, ten… enriches what they are learning in other areas. The more formal learning that you might be doing in geography, science and literature areas gets to weave into their play. They can try out for themselves the knowledge they’ve learned about how penguins live, and get to practice putting new vocabulary into action. Pretend play is a excellent way to recap other learning. You can find more ideas for all sorts of pretend play sets-up in our small world play archive. 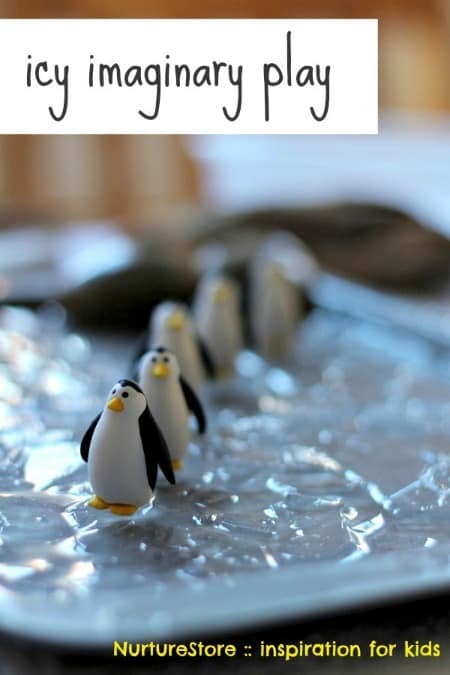 Where did you buy your Penguins? They are so cute! They are in fact little erasers Serena, which we got from Paperchase. I agree, they are cute!